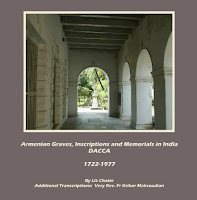 Noted Armenian researcher Liz Chater recently published a new book, Armenian Graves, Inscriptions and Memorials in India, DACCA, 1722–1977. 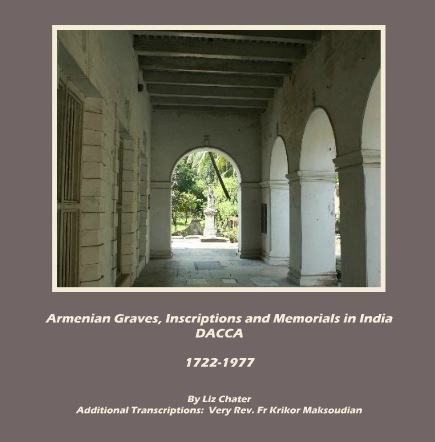 It has more than 160 color photographs of the remaining graves at the Armenian Church Dhaka (Dacca, previously in Bengal but now in Bangladesh). The book also includes more than 25 individual family tree charts that relate directly to the Armenians buried in Dhaka. The grave inscriptions are cross-referenced with the original Armenian Church death register entries, with additional information from the registers where possible. All transcriptions and register entries written in Armenian have been translated into English. Chater is passoniate about Armenian genealogy and raising awareness of Armenians in India and hopes that her efforts will help keep the history of this community alive. For further information, see http://www.blurb.com/bookstore/detail/2277738.